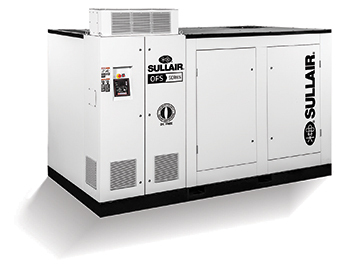 Sullair, an industry leader in innovative compressed air solutions since 1965, today announced its oil free portfolio has expanded with the addition of the OFS Series, a new line of oil free rotary screw air compressors. The OFS Series consists of models in two frame sizes, 100-200 hp and 250-350 hp, and features multiple customer-influenced improvements in a smaller footprint. All Sullair OFS Series compressors are ISO 8573-1 Class 0 certified to ensure oil free operation. Sullair OFS Series oil free compressor air ends feature rotors with a high-efficiency asymmetrical profile that are coated with an FDA-approved food grade PTFE corrosion resistant coating, offering 100 percent oil free air. The air end is supplied with anti-friction bearings designed for an L10 life of more than 100,000 hours. All OFS Series compressors are available with an optional Integrated Variable Speed Drive, which can provide up to 60 percent turn down from full load to provide improved operating efficiency and flexibility to accommodate changing operating conditions. The OFS Series also incorporates an updated controller, featuring a Sullair WS Input/Output module paired with a new User Interface panel. The controller monitors and controls the compressor, provides built-in sequencing capabilities for automatic load sharing, and continuously displays essential functions and applicable alarms on a large back-lit LCD screen. The OFS Series introduction follows on the 2014 launch of a full range of centrifugal compressors powered by IHI technology. The compressors, which also produce Class 0 Oil Free Air, are offered in two families: the T-series and f-series. T-series compressors come in complete packages, with models ranging from 175 to 2300 hp, producing flows from 550 to 11,750 scfm. f-series compressors are available in both packaged and non-packaged options – custom designed to meet the user’s specific needs – available from single stage up to four stages, offering flow rates up to 130,000 scfm. For operations in which air purity is critical, oil free air is essential. The line of Sullair oil free air compressors is ideal for applications in pharmaceuticals production, food and beverage processing, electronics, high-technology manufacturing, and textile manufacturing. Since 1965, Sullair has developed and manufactured air compressors with proven reliability and wear-free durability. Sullair is globally recognized as a leading manufacturer of portable air compressors, contractors’ air tools, stationary air compressors, compressed air treatment equipment and vacuum systems. Additionally, Sullair provides customers with a full line of aftermarket parts, fluids and services. Sullair has manufacturing capabilities in Michigan City, Indiana; Shenzhen and Suzhou, China; Mahindra World City, India; as well as a JV (IHI-Sullair) based in Suzhou. For more information, visit www.sullair.com. Accudyne Industries is the parent company of Sullair, and a global provider of precision-engineered, process-critical and technologically advanced flow control systems and industrial compressors that deliver consistently high performance and give confidence to the mission of its customers in the most important industries and harshest environments around the world. Today, Accudyne is powered by ~2,800 employees with 14 manufacturing facilities, supporting a broad range of industries in more than 150 countries. For more information, visit www.accudyneindustries.com.